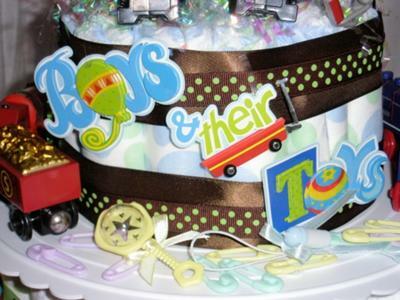 Boys and Their Toys - What an adorable theme for a diaper cake! 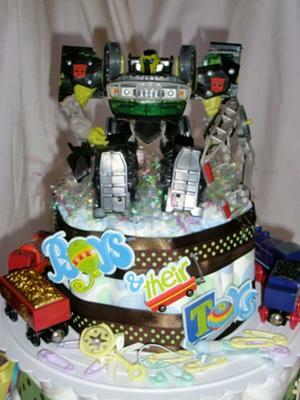 Loaded with toys a little boy would love, this diaper cake is all boy, from the boyish bugs to the Transformer cake topper. Nicely done, Janet and Jamie! 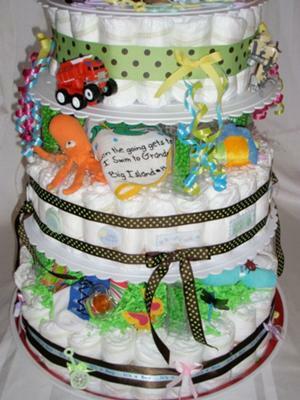 These are the talented pair who combined their creativity to make this wonderful diaper cake. And we are so pleased that they shared their work of diaper cake art with all of us! They are two of our fabulous readers who are continuing to do what other readers have done before - pay it forward with their inspirational themes, ideas, tips and pictures. 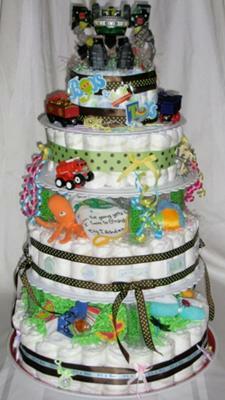 Janet & Jamie, thanks so much for your awesome diaper cake! 4-Tier cake. I used 90 diapers in 3 sizes and platforms and risers for a wedding cake. 1st Tier is bugs. 2nd Tier is ocean theme with finger puppets. 3rd tier is toys. Top is a transformer. I like the cake's model and it is with exceptionally well designed and put together.